According to AMD, the entire Threadripper project started out as an experiment. A handful of engineers just decided to use their spare time to explore just how far they could push the Zen architecture, which was then still in the early stages of its development. These high-performance CPUs weren't even on the company's roadmaps until the team made a proposal to AMD's top management and got their idea greenlit. By all accounts coming out of AMD, Threadripper was and continues to be a passion project. AMD designed a scalable architecture for the Ryzen lineup, with four cores and grouped into functional units called Core Complexes (CCX). Two of those, with their associated caches and resources, are used in every Ryzen CPU (except the ones with integrated Vega graphics). The Threadripper team found that they could squash multiples of those dies together within the package design created for the Epyc server CPU platform, and also double the number of memory channels and PCIe lanes supported. 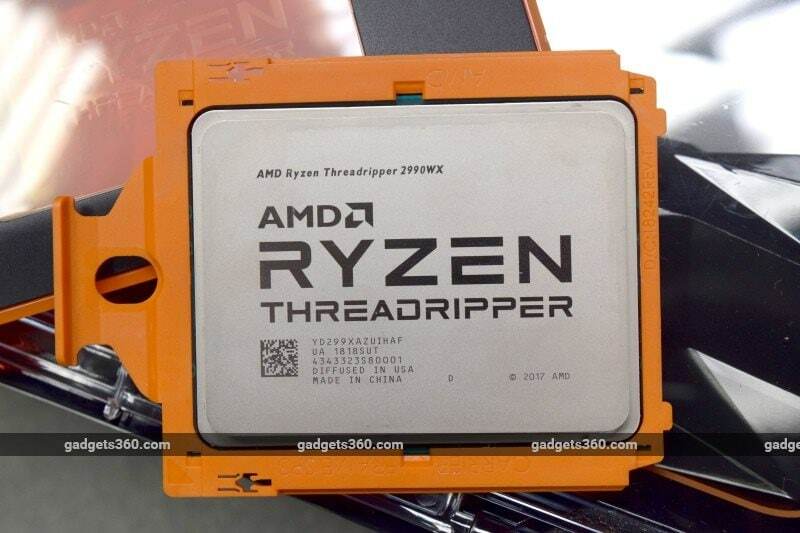 Two dies and four CCXs were used to create the original 16-core Threadripper 1950X last year, but as it turns out, the team never intended to stop there. The plan, even before the first Threadripper models were announced, was to go even further. Complexity prevented this from happening last year, but the products and the strategy are now in place. The second generation lineup has just been launched, capped by the behemoth Threadripper 2990WX with a staggering 32 cores. AMD is not shy about reminding us that just under two years ago, quad-core CPUs were the norm and Intel's Core i7-6950X with 10 cores was the absolute best you could do, if you were willing to spend nearly Rs. 2,00,000.
Who can really make use of 32 CPU cores? Is there any point in scaling up this far? What are the tradeoffs, and what will it cost you? We have the answers to all these questions in our full review of the Ryzen Threadripper 2990WX. There are two series in the second-gen Threadripper lineup, each with two models. The X-series (totally not a dig at Intel's confused Core X-series, we're sure) consists of the Threadripper 2920X and 2950X, which are direct replacements for last year's 12-core and 16-core models respectively. These are aimed at enthusisasts and gamers who want to multi-task without any slowdowns, edit 4K video, stream while gaming, or compile software without spending too much money. X-series models have 180W TDP ratings and 32MB of L3 cache in total across dies. Last year's 8-core model appears to have been dropped, eliminating an overlap with the Ryzen 7 line. The new WX-series consists of the 24-core Ryzen Threadripper 2970WX and the flagship 32-core 2990WX which we have with us today. The target audience in this case is users with workloads such as rendering cinema-quality video and effects, 3D content creation, ray tracing, and massive-scale virtualisation. These are all highly parallel workloads that can actually scale up to utilise all available CPU resources - or at least allow users to get other work done alongside. These CPUs can put out up to 250W of heat and you get 64MB of L3 cache in total. According to AMD, each Ryzen Threadripper 2990WX is made up of approximately 19.2 billion transistors. All four models use AMD's revised Zen+ architecture, which we first saw with the Ryzen 2000 series earlier this year, and are manufactured using a 12nm process. The improvements are subtle, and are mainly concerned with optimising latency - all cache levels and system RAM benefit by between 2 and 15 percent. There are also tweaks to the XFR and Precision Boost features that allow each chip to push its clock speed higher for as long as heat and power conditions allow, and to smoothly adjust speeds on the fly as fewer or more cores are used. 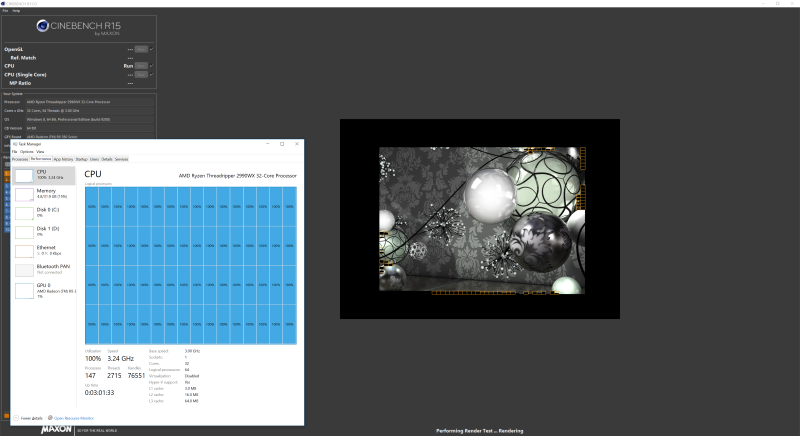 Zen+ cores can also run faster while drawing less power. All in all, there's no major architectural change, but AMD says that the performance gains from these refinements are still significant. As with every other Ryzen CPU, the Threadripper models are fully unlocked for easy overclocking. All second-gen Threadripper CPUs will work with existing motherboards using AMD's X399 chipset, which is a pleasant surprise considering how much beefier the new WX-series models are. All you need is a quick BIOS update if you're using a motherboard purchased prior to the second-gen Threadripper launch. Gigabyte and MSI have still launched new models, which they say have more robust power components, and Asus has released a fan kit to help cool the voltage regulators on its existing motherboards. According to AMD, while these might help with overclocking and pushing the limits of XFR, all existing motherboards will let the new CPUs run perfectly well within spec. The same holds true for all existing Socket TR4 coolers; both air and liquid. However, AMD has still teamed up with Cooler Master to license its popular Wraith brand to a new model, the Cooler Master Wraithripper. This massive block of aluminium and copper has seven heatpipes and a huge number of fins sandwiching a 120mm fan. 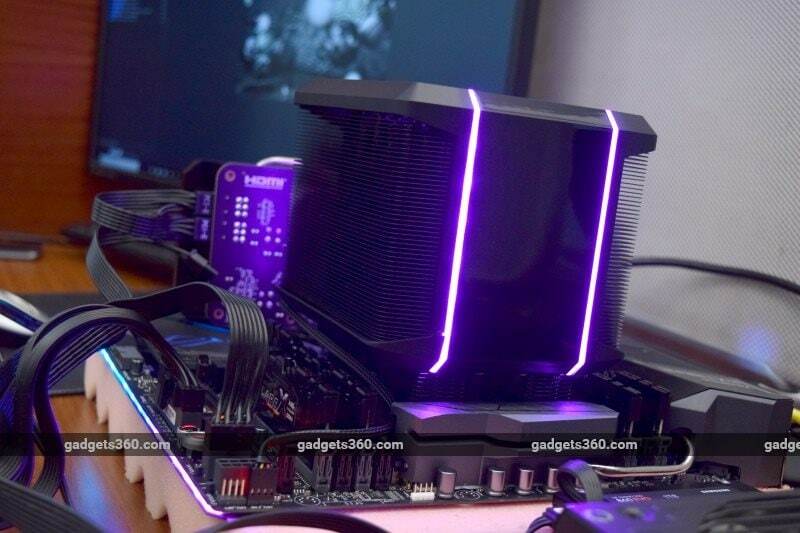 It's designed not to interfere with tall RAM modules, and of course it has RGB LEDs all over. It also weighs a surprising 1.6kg. AMD won't include one in the box with each Threadripper because users are likely to want to choose a liquid cooling solution. It will be sold independently by Cooler Master for an expected price of US$120 (approximately Rs. 8,340 plus taxes) and will go on sale here in September. The 32 cores of the Ryzen Threadripper 2990WX are not all equal. There are four dies of eight cores each, all with direct connections to each other using AMD's Infinity Fabric in a mesh configuration. However, only two of the four dies are connected directly to external PCIe and DRAM resources. These two are referred to as "IO dies", while the other two become "compute dies". In essence, AMD has transposed the design of what would have been a dual-CPU system into a single socket. There are implications for latency when it comes to memory access, but AMD says that its own intelligence combined with the Windows task scheduler can help make sure that the IO dies are given priority. One further consideration that users should know about is the Non-Uniform Memory Access (NUMA) architecture being used, as opposed to the common Unified Memory Access (UMA) that all desktop processors use. So far, even enthusiasts have never had to know about what any of this is or how it works, but with 32 cores, things are a little more complicated. NUMA essentially allows processing tasks to be localised to one of two "nodes", consisting of one IO die and one compute die each. This improves memory latency by minimising operations that make data "hop" from one pair of memory channels to the other across the Infinity Fabric link. On the downside, this does slightly affect the total memory bandwidth available. The WX-series Threadrippers are locked into NUMA mode, which AMD says was unavoidable in achieving backward compatibility with the X399 platform. Users with X-series Threadrippers will be in UMA mode by default but can choose to switch to NUMA, which might give them an advantage in lightly threaded applications such as gaming. Most consumer software is not NUMA-aware and will not know how to detect or take advantage of it, but that might change soon thanks to the Threadripper line. For that reason, and for general compatibility issues that might crop up, AMD lets users temporarily enable a Legacy Compatibility Mode. With the Ryzen Threadripper 2990WX, you can choose Half-core, which only lets the operating system see two dies with 16 cores and four RAM channels, or Quarter-core, which restricts processes to one die with eight cores and dual-channel RAM. AMD says that some apps, especially games, can benefit from this. Incidentally, you can have up to 2TB of RAM using all four channels, but a Windows 10 Pro license will limit users to 512GB. StoreMI, an AMD software feature that lets you combine faster and slower storage media, is also fully supported. Ryzen Threadripper CPUs offer users a massive 64 lanes of PCIe 3.0 connectivity. Desktop consumer CPUs are far more limited, and even Intel only goes up to 44 lanes on its highest-end Core i9 models. Thanks to this, users can plug in up to six graphics cards for GPU-bound computing, or an array of PCIe storage devices for phenomenal storage bandwidth. This is one of the key appeals of the platform for uses in professional content creation. AMD's Ryzen Master software is a relatively easy way for even casual users to play with overclocking. The big new feature is Precision Boost Overdrive which lets you overclock with XFR and Precision Boost enabled, but without protective limits on voltage. You could unlock more headroom without as much effort as manual overclocking, but it will void your warranty. A processor this high-end requires a solid foundation, and you won't find X399-based motherboards going cheap. The lowest amount you can expect to pay is Rs. 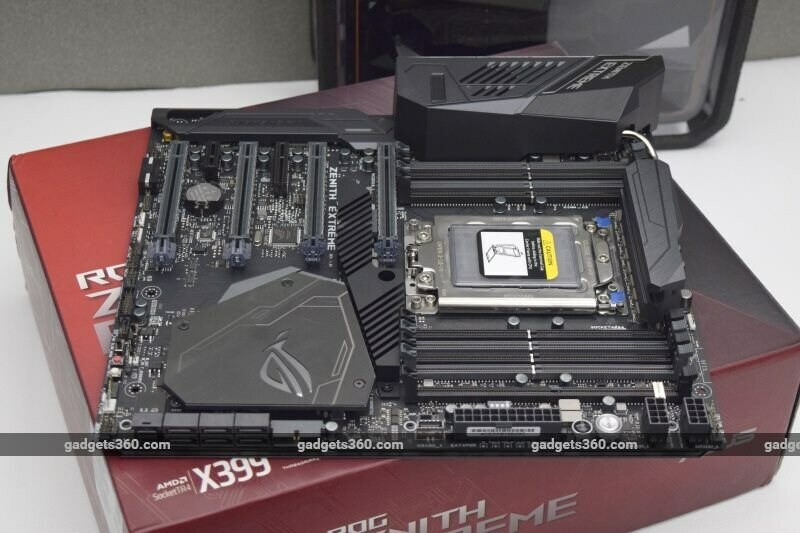 25,000, but today we're using the top-of-the-line Asus ROG Zenith X399 Extreme, which costs Rs. 41,850. This model was launched along with the first-gen Threadripper CPUs, and rather than release a new one, Asus has developed a clip-on fan kit that will help you cool the VRMs. This should only really be necessary for overclocking, not for ordinary use. This is a fairly large E-ATX board and you'll want to make sure you have enough room in your cabinet of choice. Asus has decked it out with nearly every conceivable feature. A little OLED screen on the rear IO shield shows more detailed information than the usual seven-segment LEDs, and there's a backplate that mainly exists to house an RGB LED strip that runs the entire length of the board. You get loads of connectivity including eight USB 3.1 Gen 1 (5Gbps) ports, Type-A and Type-C USB 3.1 Gen 2 (10Gbps) ports, integrated 802.11ac/ad Wi-Fi, onboard Gigabit Ethernet plus a 10-Gb Ethernet expansion card, and SupremeFX S1220 audio. The only thing missing is Thunderbolt 3, which is more of an overall AMD platform and licensing limitation. There are six SATA ports, three M.2 slots, and even a server-grade U.2 port for PCIe storage. Two of the M.2 slots are implemented on a riser card that fits into its own holder adjacent to the RAM slots. Asus calls this "DIMM.2", and it even lets you mount a tiny cooling fan for your SSDs. The four PCIe x16 slots are metal-plated and there's an extra Molex power connector to supplement the PCIe bus power for stable operation. We ran into a slight issue when building our Threadripper test system. The extremely large Wraithripper air cooler completely blocked the first PCIe slot - though we were pleased to see that the RAM slots weren't affected at all, which is often the case. Asus seems to have presumed that most people will use a much smaller waterblock with an external radiator. Other than that, it was all smooth sailing with the ROG Zenith X399 Extreme. The BIOS is well laid out and easy to get around. Asus also lets you download its own software for overclocking, but we think that users will be better served by AMD's Ryzen Master utility and should not try to use both. Threadripper CPUs are physically enormous. Each one has four physical Ryzen dies, all linked and able to communicate with each other using AMD's Infinity Fabric interconnect. The X-series models have two real and two dummy dies to even out heat distribution, but all four are active in the WX-series models. 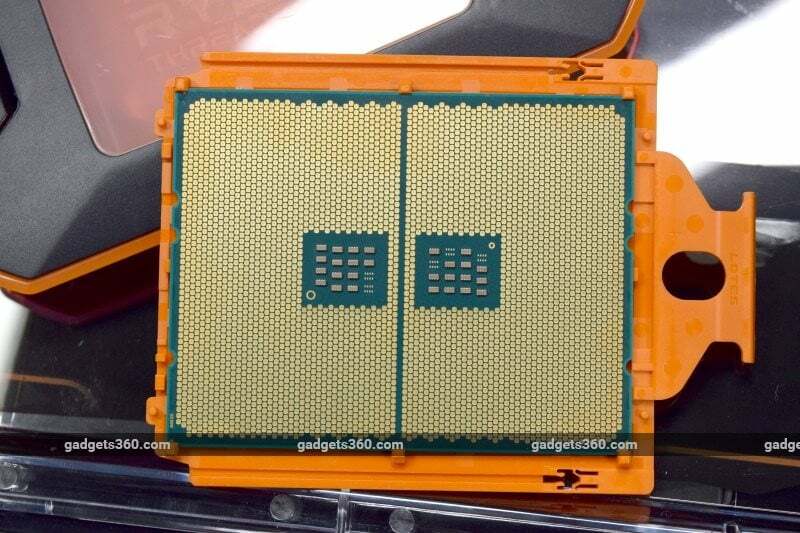 The CPU socket is called TR4 and it has a staggering 4,094 contact pads. Interestingly, this is AMD's only consumer CPU to use an Intel-style Land Grid Array (LGA) rather than physical pins. Each Threadripper CPU comes already fitted with a bright orange plastic caddy that isn't meant to be removed. The installation process is delicate, and not like you might be used to with ordinary CPUs. You'll need the special Torx screwdriver that's included in the box to unfasten a load plate, and then slide the orange caddy into an inner rail before clamping and screwing it all back down. Thankfully, installing a cooler is as simple as tightening four screws. A bracket for liquid coolers is also included with each CPU. We built our test system using the Asus ROG Zenith X399 Extreme and Cooler Master Wraithripper, as well as 32GB of G.Skill FlareX DDR43200 RAM (4x8GB), all supplied by AMD. We should note that the company makes no secret of validating review samples before sending them out, and these products were not factory-sealed. We chose this air cooler first of all because it's new, but also because AMD is officially touting that it's more than enough to get the full performance of a 250W flagship Ryzen Threadripper 2990WX, without overclocking. We added a Samsung SSD 950 Pro boot drive, a Samsung SSD 860 Evo for storage, an XFX Radeon R9 380X graphics card, and a Corsair RM650 power supply of our own. We tested with the Asus PB287Q 4K monitor. AMD strongly recommends the latest version of Windows 10 for best performance, and we downloaded all the latest updates and drivers for our components. We have AMD's own Ryzen 7 2700X for comparison, just to illustrate how great the performance difference can be with 32 cores rather than eight. We also have the test results of Intel's 10-core Core i9-7900X, which was the beefiest processor we've ever tested up until this point. It isn't a fair comparison by any means, either in terms of specifications or price, but Intel's 18-core Core i9-7980XE is much more expensive and isn't easily available in India. Jumping right into test scores, we have to note that performance scaling isn't directly proportional to core count. A lot of software cannot take advantage of so much parallelism, for example 7-Zip rarely managed to keep more than four threads saturated. It's also very likely that Windows 10's task and process scheduling capabilities will improve with future updates. As you can see from the table, most scores in content creation tests are significantly better than anything we've seen before. AMD has absolutely produced a monster of a CPU here, and anyone who works with such software for a living will instantly benefit from having this kind of power right at their fingertips. Some tests ran so quickly that it wasn't even possible to tell whether all cores had ramped up, or whether the CPU had even hit its limits. The overall cost of a Threadripper PC could be justified in terms of time saved for a lot of working professionals. With that said, a CPU as beefy as the Ryzen Threadripper 2990WX isn't the best choice for everyone. If you're just an enthusiast or gamer, you absolutely do not need to spend this kind of money. It's nice that you can get good performance in games, but even AMD tells us not to expect it to be better enough than a 16-core Ryzen Threadripper 2950X to be worth it. Overclocking is fully supported, with unlocked voltage controls and frequency as well as memory speed multipliers. While we did not overclock manually, your mileage will vary depending on your power and cooling hardware. We also have to talk about how silent the Wraithripper is. Desipte the 120mm fan being sandwiched between such dense stacks of fins, it barely produced a dull hum even under massive load. While we do love how imposing this cooler looks, a lot of all-in-one liquid coolers will actually be less expensive, so it will have rather limited appeal. Who really needs 32 cores? The answer is fairly limited, but the perspective that AMD offers is that the new Ryzen Threadripper 2990WX is quite a bit less expensive than Intel's current (though dated) flagship, the 18-core Core i9-7980XE, and handily outperforms it in specific but useful tasks. AMD's official listing price is Rs. 1,25,990 plus taxes, which comes to roughly Rs. 1,49,000, and then you have to factor in the cost of a suitable motherboard, quad-channel RAM, power supply, and graphics and storage hardware of your choice. If you're investing in a PC for heavy work, this hardware can drastically reduce the amount of time that work takes, so it does have tangible benefits for businesses. At the same time, this CPU is well past the point of diminishing returns for gamers and most enthusiasts - AMD has even built in ways to make Windows think this is a lower-performing CPU just to deal with potential compatibility issues. If you already have a current-gen or recent Core i7 or Ryzen 7 processor, it would make little sense to upgrade now. This leaves AMD with a winning product on its hands, but it will be up to the company to promote it well and explain its benefits to potential buyers. AMD's global market share is still tiny compared to Intel's, and in India, brand value counts for a lot. With no branded PCs available (and none confirmed to be coming up either), AMD is counting on retail sales and system integrators right now. While enthusiasts might happily go for the X-series Threadripper CPUs to build PCs with themselves, corporates and working professionals need a more formal distribution and support structure. product The AMD Ryzen Threadripper 2990WX is the world's first 32-core consumer CPU, and it's priced relatively within reach. Do you really need one?